Gaumond’s Auto Body is a third generation family owned and operated business that has been serving the community with quality collision repairs since 1957. We have the experience and the equipment necessary to repair all makes and models, from the smallest repairs to the most extensive collision damage. We are here to help you through the entire process, from confusing insurance paperwork to setting up rental car pickup and delivery. Our quality repairs, customer service and attention to detail are what have built our business over the last fifty six plus years. Being a family owned business and having families ourselves, we understand the importance of safety, convenience and the peace of mind that comes with having your vehicle properly repaired. 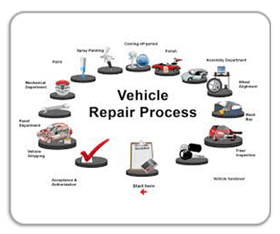 So, if you, a family member or someone you know is ever in need of top quality collision repair, remember you can depend on the company that the community has turned to for over fifty six years.